According to the Anti-Defamation League, Trump needs to stop using the phrase "America First" because it's "anti-Semitic." 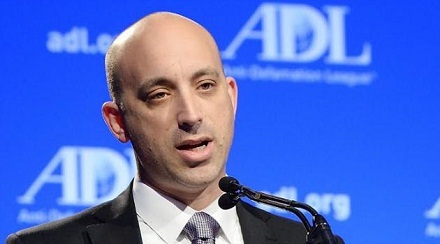 The ADL press release shared yesterday urged Trump "to reconsider his use of the phrase 'America First'," saying it was used by so-called anti-Semites "seeking to keep the nation out of World War II." "The most noteworthy leader of the 'America First Committee' was Charles Lindbergh," the ADL said, "who sympathized with the Nazis and whose rhetoric was characterized by anti-Semitism and offensive stereotypes." Incidentally, the hysterical Bloomberg columnist Eli Lake we reported on yesterday took almost the exact same angle in his column, saying Trump using the term "America First" was reminiscent of the "Nazi era." While this is obviously a smear attempt, I'd guess when most people hear "America First" they think of exactly what the term says: putting America first and advocating for our own interests, serve ourselves rather than try to act in the best interests of the whole world, or countries who have bought off our politicians. Other than that, they at most think of Patrick Buchanan, Lindbergh's speech was 75 years ago, most people who heard it at the time are now dead. You can read Charles Lindbergh's speech which they claim is "anti-Semitic," there's nothing anti-Semitic about it, he simply said America's interests and those of Great Britain, Roosevelt, and certain Jewish leaders pushing for war are not one and the same. "I am not attacking either the Jewish or the British people. Both races, I admire. But I am saying that the leaders of both the British and the Jewish races, for reasons which are as understandable from their viewpoint as they are inadvisable from ours, for reasons which are not American, wish to involve us in the war." "We cannot blame them for looking out for what they believe to be their own interests, but we also must look out for ours. We cannot allow the natural passions and prejudices of other peoples to lead our country to destruction." Israel and America are different nations with different interests, saying so is not "anti-Semitic." For example, most Americans do not believe giving billions to Israel every year is in their interest, earlier this month 61.9% said the US is giving "too much" foreign aid to Israel. Despite this sentiment, earlier this week 83 US Senators out of 100 signed on to demand Israel be given the "largest single pledge of military assistance to any country in US history." According to the ADL's interpretation of history, pointing out this divergence makes you an anti-Semite. This is why smearing someone as an "anti-Semite" no longer carries any weight.